I think the squirrel came in from the right, the hawk stooped from a pine tree on the left and missed the catch, whereupon the squirrel departed leftward as fast as its little paws could go. This entry was posted on 2019-01-19, 07:40 and is filed under Oddities. You can follow any responses to this entry through RSS 2.0. You can leave a response, or trackback from your own site. It’s fun attempting to recreate what happened in situations like this. 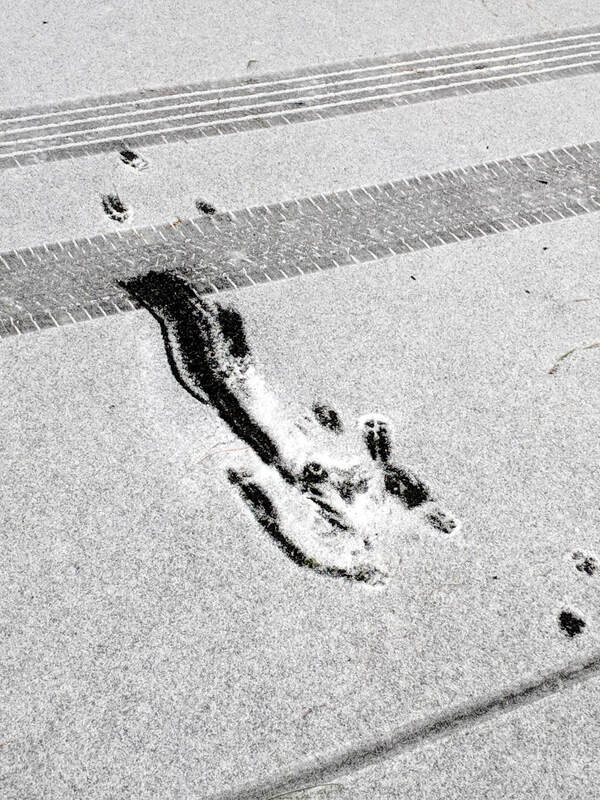 However, from what I can see in the enlarged photo, the tracks indicate “it” was traveling to the right to me from the toes. The driveway wall is off to the right. If I’d had my wits about me, I’d have looked for tracks either along the top (headed left) or bottom (headed right). Now, we’ll never know.